Here's a rule of thumb for authors' lives: When we're at our most interesting, we're at our least productive, and when we're at our most productive we're at our least interesting. When I'm sitting in a teahouse in Chengdu, talking with fellow writers from around the world, or staying in a small room just inside the Silver Gate of Diocletian's Palace in Split, I can guarantee you I'm not getting much writing done. Conversely, when I'm pounding out five pages a day, I don't have much in way of interesting anecdotes to report. Before Marianne retired, she used to come home from a long and busy day at the Bureau of Labs and say, "How was your day?" To which I'd reply by lifting both hands and wriggling the fingers as if typing. A writer's life can be glamorous and even exciting at times. But not when he's writing. All of which is my roundabout way of saying that I'm beginning to hit stride on the new novel. I began it at the same time I began Chasing the Phoenix (now forthcoming from Tor Books) and set it aside when that novel (in which Darger & Surplus, with perfectly innocent intentions, wind up conquering Post-Utopian China) caught fire and demanded all my thought and attention. On finishing Phoenix, I took a few months off to work on short fiction. There's no real money in short fiction, alas, but I learned long ago that I was not put on this planet in order to become rich. So I might as well do what I love. Which includes not only novels but the short form as well. But now the novel I set aside has caught fire and is demanding more and more of my time and attention and even love. So I may or may not have interesting tales to share with you here in the coming months. It all depends on how much time I can steal from my chief duty. Up above is the cloth notebook dedicated to the novel, resting atop a rather large volume I'm reading for research. Both resting, appropriately enough, on the dragon rug in my living room. And because some of you will want to know . . . This book will be my third and last dragon novel. The working title was originally Mother of Dragons before a certain Old Pal of Mine decided to apply that title to a claimant to the throne of Westeros in his rather successful series of fantasy novels. So I'll have to come up with something else. Will the three books together comprise a trilogy? Well... I never intended them to. But let's be honest. That's how most readers will receive them. Twenty-some years ago I was driving to Pittsburgh and talking with Marianne about fantasy and locomotives. I made a quip about the Baldwin Steam Dragon Works and she laughed. We drove a mile or so down the Interstate and I said, "Write that down for me, please." From that seed came The Iron Dragon's Daughter, the tale of a girl who'd been stolen by the elves and forced to work in a Dickensian factory, building dragons. It was always intended as a stand-alone novel. Sometimes a fan would ask for a sequel -- but I thought it would be too cruel to take Jane, who had escaped Faerie at last, and throw her back into the hopper of plot. Then, roughly a decade ago, Marvin Kaye told me at a convention he was putting together an anthology of dragons stories and would like to have one with the same kind of dragon (mechanical, implacable, evil) as in my novel. I didn't have any ideas for such a story and told him so, but promised that if I came up with one by his deadline, I would send it to him. The day after I got home, as sometimes happens, the opening scene for exactly such a story came to me. I wrote it down. One thing led to another, and I had a novella. So I sent it to Marvin, and it became part of The Dragon Quintet. And I had the beginning of another novel. In TIDD, Jane Alderberry's essential problem is that she's trapped in a world where she doesn't belong. No matter what she tries, she cannot find a place for herself. In what became The Dragons of Babel, however, Will le Fey does belong in his world and his task is to find a proper role for him to fill. This novel too was written as a stand-alone. But by merely existing, the first novel created a dialogue with the second. In many ways, the two novels were the opposites of each other. So now I had Thesis and Antithesis. Synthesis -- the final volume of a (cough!) trilogy -- hung over the entire enterprise like a third shoe waiting to drop. But I had no ideas for such a volume. None at all. More years passed. At last, an idea came to me, a way of opening up the rich, self-contradictory world of Faerie in a direction orthogonal to the other two, one which raised the possibility of answering all the questions raised by the first two books, and achieving other goals as well. So I began writing. This one is going to be a stand-alone novel as well. But it's inevitable that readers are going to think of it as the last third of a trilogy. Now all that's needed is lots and lots of hard work. And a new title. I'm thinking of calling this book The Iron Dragon's Mother. But maybe that would confuse readers? I don't know. If anybody out there has a brilliant suggestion, I'd be glad to hear it. 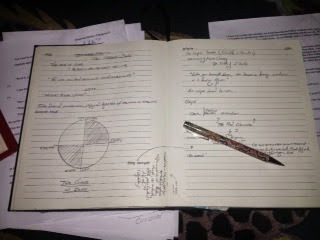 Above: Top, my novel notebook atop a research book; bottom, notes. I like the Iron Dragon's Mother. But I can't say if it lashes you too tightly to TIDD. Is that what you mean by confusing? I don't want a reader confused as to whether it's the book they've read or the one they haven't. How about 'The Dragons of Babylon'? Delighted to hear it's being written. I don't think "The Iron Dragon's Mother" works for me, but I've got nothing better to suggest at this hour of the morning. "Mother of Iron"? Or does that not fit with where it's going? Which Red Book is that in the photo, by the way? Ooooh, very exciting news! IDD is one of my all-time favorite books ever! Your final chapter when Jane is back home in 'our' world always brings tears to my eyes when I read it. I am sorry to say I don't have any useful suggestions on the title, but a question... does this book looming in the future possibly mean we'll see an E-Book version of Iron Dragon's Daughter? I've got the HC of course, but have been wanting to add IDD (and many other books from your back-catalog such as Gravity's Angels and Jack Faust) to my carry-around-on-my-phone E-Book collection for immediate spontaneous reading wherever I am. Also, this makes me ridiculously excited. The Dragon books and stories in Faerie are some of my most favorite tales hands down. Very excited for more Faerie and more Darger and Surplus! The de-sedimentation of Faerie history as interpreted in the matriarchal culture of dragons. You can never have enough dragon-pedantry. I am so happy to hear about this new novel. I completely agree with Greg Stewart about IDD, and indeed about the last chapter, which had a bizarre resonance for me since as I was in the very last moments, I got a phone call from a very old friend, who, since he had had a schizophrenic break, had never made it back to the "real world". Thanks so much for your work! for me you are one of the great literary artists of our time. Progenitor of Iron sounds like a good melding of Zamzummim's suggestion and the spirit of your title.